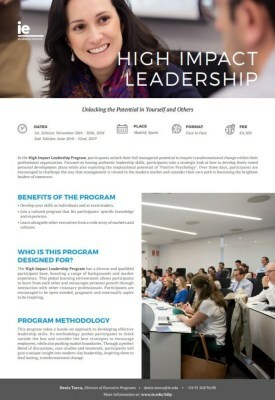 Our High Impact Leadership Program encourages participants to unlock the potential in themselves and others. A hands-on insight into authentic leadership, this program teaches participants how to strategically utilise social media and personal development plans, while adopting a ‘Positive Psychology’ to inspire employees . Over three days, participants will be encouraged to challenge the way that management is viewed in the modern market and consider their own path to becoming the brightest leaders of tomorrow. The program also works in conjunction with the IE Leadership Pack, which is designed to provide support to all organizational levels. The IE Leadership Pack provides a strong foundation on which participants can hone their management skills, holistic thinking and strategic vision. Focus on participants’ development both as individuals and as team leaders. Program leaders become mentors to participants, adapting the program to fit specific knowledge and experience. Participants learn alongside other executives from a wide array of markets and cultures. Recognize how power can be used effectively in complex organizations. Experience leadership in a diverse environment with a global outlook. Learn how best to communicate with employees at all organizational levels. Siegfried Hoenle, Professor of High Impact Leadership, explains the importance of approaching leadership as an ever-evolving relationship. Inspiring your team requires awareness of your own strengths and weaknesses to provide authentic leadership that drives change and launches your organization into the future. I had the opportunity to challenge my look at management over 3 intense days at IE Business School in Madrid. As our Professor, Juan- Carlos Pastor mentioned, learning needs to hurt for us all to derive the benefits to change our ways of leading. Complemented with a full day on the topic of Positive Psychology with Sigi Höhnle, both challenged us to rethink leadership and use our strengths even better. I can hugely recommend the condensed, intense 3 day training to anyone willing to rethink the way they lead. It is a great tool for personal growth. It helps to improve and make better the day today work.